St. Christopher’s open a second hostel in Paris! – Ryans-Air-Adventures! St. Christopher’s open a second hostel in Paris! The hostel industry’s Patron Saint of travellers, St. Christopher’s, sure have a winning formula when creating some of the coolest budget accommodation on the market – and their newest Parisian hostel is no exception! Located in the revamped 10th Arrondissement and opposite Gare du Nord station, it is extremely accessible for international travellers maximising their time in the ‘city of lurve’. Romance is already on the cards for what is easily (as rated by HostelBooker’s customers) Paris’s best hostel! 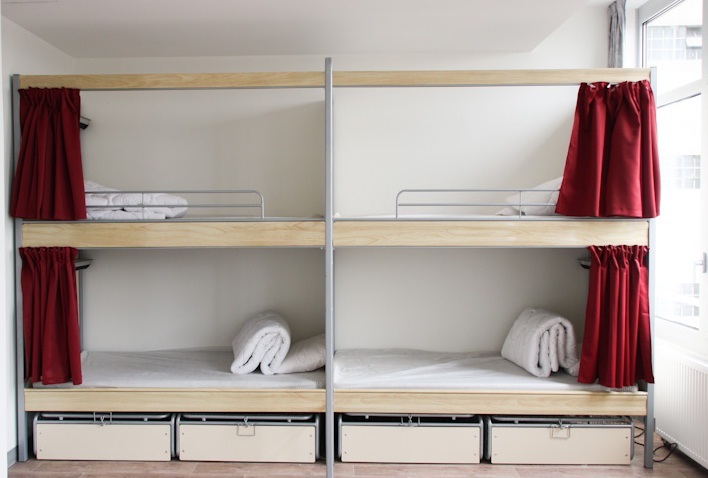 With 600 beds, ‘St Christopher’s Gare du Nord’ is also now the biggest hostel in the whole of France! This will only be eclipsed when the Generator opens their 1,000 bed property in the Winter of 2014. However, when comparing bed volumes – as St. Christopher’s has a sister property in Paris already (just under 400 beds), they will be collectively be on par with Generator’s future offering. The new hostel reportedly cost ‘Beds and Bars’ roughly 40 million Euro, so no expense has been spared in creating what is set to become a premier venue for travellers and locals alike! 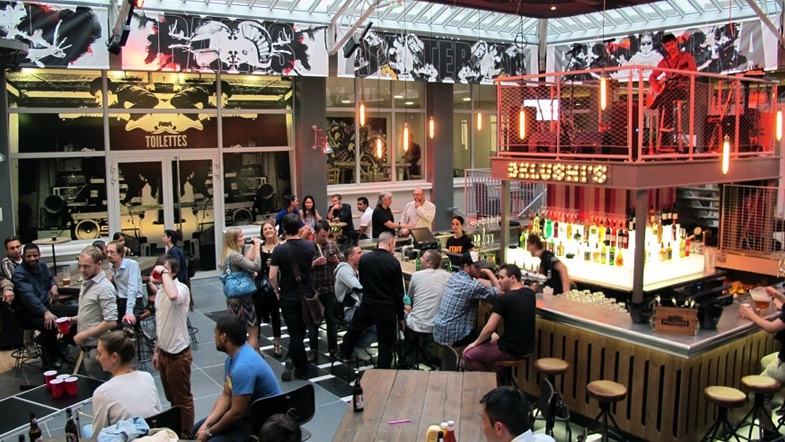 The Belushi’s bar is the largest opened so far, along with a huge basement chill-out area and a quirky, street level Parisian cafe. The venue hosts a range of different nights and is fast becoming booked for live gigs on Fridays and Saturday nights. Check out the rock stage-cage on top of the bar – talk about maximising space and rock god status! The accommodation comprises roughly 50 private rooms, with a huge selection of various dorm rooms on offer. All dorms feature comfortable, modern sleeper-carriage pod beds with privacy curtains, power points, reading lights and lockers. In line with the modern St. Christopher’s product offering, there is also a ‘girls only’ floor, excellent facilities for groups, bangingly fast WiFi and super friendly staff. Another feather in the cap for the party loving folk at St. Christopher’s – mixing secure, safe, fun and great value accommodation with just the right je ne sais qoui to keep us all coming back for more! This entry was posted in Backpacking, Budget travel, City Break, Holiday ideas, Hostel Industry News, Hostels, Travel and tagged Beds and bars group, belushis bar paris, best budget accommodation paris, best hostel in paris for groups, biggest paris hostel, cheap accommodation paris, coolest hostels in paris, french hostels, gare du nord chap accommodation, generator hostel paris, girls only floors in hostels, hostelbookers paris, hostels near gare du nord, paris best hostels, paris party hostels, patron saint of travellers, ryan bennett, ryans air adventures, see the world for less, st christophers gare du nord, st christophers paris, St. Christopher's Hostel. Bookmark the permalink.